Swindon Masjid is pleased to announce Azaan (Adhan) radio for your home. It is simple to set up yet effective. You can buy it from mosque (masjid) itself for £95/-. Insert telescopic antenna and connect ac adapter to mains. Press E (PGM).When PGM appears on the screen,enter your desired frequency (454.40625), then press E to store the frequency in the memory. You will have to wait for Azaan (Adhaan) time to actually test the radio. If it doesn’t work, please use the comment option below and we can further assist you inshAllah. 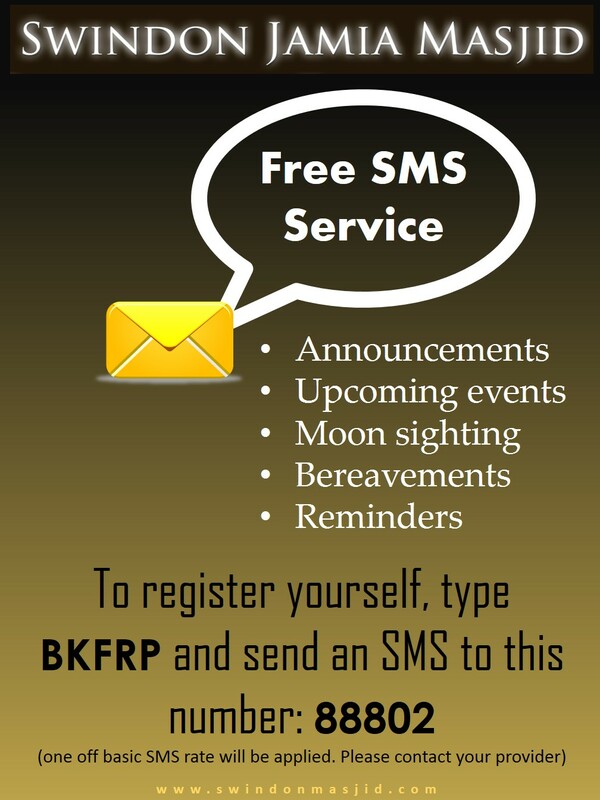 We are launching a free SMS reminder service to keep you all informed of all the latest news and events such as Eid updates or Bereavement in the society. One off sms charge will be applied. For SMS rate, please consult your provider. Swindon Masjid also has its own App for Android users to give easy access to users to daily salaah time. To download visit the app on Google Play. Brothers I hope that all is well Insha Allah and Jazkallah for the service that you provide for the Muslim community in Swindon. I am writing to seek your support and advice in coming to Swindon as part of our fundraising activities. We were about to come this morning but due to the weather, we postponed. We are based in Bristol and have recently agreed to purchase former factory and turned it into a mosque in an area that has no Masjid with the most Muslim population in Bristol. We have Al hamdullilah been doing well with our fundraising and we have already one instalment which was £105,000 out of £470,000 of the purchase price. We are about to pay the second instalment which is £105,000 by this Nov 11th 2013. We are only short of £17,000 to make this payment and Insha Allah with your support and others we can save the mosque. If we somehow fail to pay this instalment by the due date, we risk the loss what is been paid and the whole project. So brothers, we would like to visit Swindon and if you can please allocate this Friday for us to fundraise in the mosque and help us go around the city. Tawfiq Masjid and Centre is one of the biggest mosque in Bristol and we hope that we will be useful to all Muslims and mosques in the country. I’m trying to find moulana Mohammed from South Africa. Sorry for late reply. I was told by Brother Mohammad that you got hold of him the very next day. I am Riyaz from PUNE india and will soon planning to arrive at SWINDON. I would like to get in touch with some Muslims Brother there. I am coming with my family and little worried about accommodations etc. I request please support me with any advice or help will be much much appreciated, Zazak Allah. If you could respond me with number that I can dial from INDIA would be great. Can I just know whether there is a praying space for the sisters? Are women classed as inferior, as they were in Europe in 1437. Is that why you segregate them? Your ideology is incompatible with western views so why do you live here? I am a manager of a care home and at present looking after a muslim who could really use a friend, he has no local relatives to come and visit him and encourage him to pray, you see he has dementia and unable to visit a mosque. Saad used to have a friend who visited him on a weekly basis but he has not come for a long time and is uncontactable.Please could somebody help me to find a friend for him he would be made most welcome at the care home, if only for ten minutes once a week. Diane Cole Seahorses Care Home 01793 740109 This is a genuine request. Did this mosque stop supporting any requests coming from new people who comes from other cities? I want to register my daughter for sisters weekend classes but no response at all!!! May be Admin staff’s are so busy on other activities? I would recommend visiting the mosque and speaking to the Imam directly.